previous ones. Hence, the confusion arises to select the best toothbrush to care for their teeth and gums. What are the recommended toothbrushes for periodontal disease? 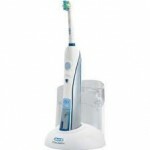 – an increased amount of brushing in same duration of time. – ability to rotate at a faster speed. – added brush strokes help remove more amount of embedded plaque and debris, decreasing the chance of gum disease from developing. They are available as battery-powered in which the handle maybe too bulky and sonic types which can be plugged-in. Using sonic power to clean teeth, newly developed sonic toothbrushes do not spin or rotate but have a vibrating motions that shake loose hidden plaque between teeth. 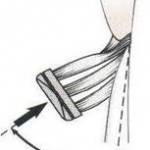 The bristles can also reach out to the crevices. Manual toothbrushes are also equally good in removing plaque. There are variations in the number of tufts as well. Odd numbered transverse rows are all of the same length and vice versa for the even numbered ones. 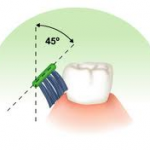 Some have an accessory brush in the form of a tuft of bristles to reach the difficult areas and those with tooth malpositions to assist in removing plaque and debris from gingival pockets to prevent periodontal disease. i. Tooth sensitivity – an electric toothbrush rotates at a higher speed which may not be comfortable for those having sensitive teeth. ii. Cost – they maybe a little more costly than manual toothbrushes and you will need to replace the removable toothbrush head every three or four months. But this expense may compensate for your long dental bills as an electric toothbrush keeps teeth cleaner. iii. Bristles – choose soft bristles so that you don’t damage your gums and with rounded tips. Medium and hard bristles tend to destroy the protective enamel layer depending on how vigorously you brush. A soft bristles brush can remove stains and plaque as well as providing stimulating massage effect to your gums. The recommended toothbrush for periodontal disease is different from a person with a healthy mouth. Periodontal toothbrushes or sulks have 2 or 3 rows of bristles with a potential action in removing deposits present sub gingivally, under the gums. Bass Method is the best brushing technique recommended by dentists to patients with periodontal disease. 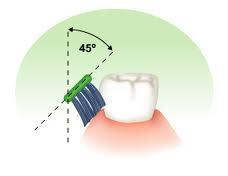 The toothbrush is placed at an angle of 45 degrees to the tooth axis inside the gingival groove below the gum line. 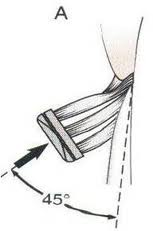 Then, a vibrating movement is performed around 10 seconds for groups of 2-3 teeth. The overall time for brushing is usually about 2 minutes. Electric toothbrushes eliminate bacterial plaque much faster, but subgingival plaque is eliminated better using the Bass Method. This is why in the case of patients with periodontal disease, the combination of electric and manual brushing is advised. Besides brushing, it is also important to clean between teeth to prevent plaque build-up on tooth surfaces and below the gum line. Interdental brushes, dental floss, dental tapes and other products are available and always use fluoridated toothpaste for better results. Do not forget to change your brush every two or three months as worn off bristles are useless. A new toothbrush works better in cleaning the teeth. Follow these tips above and keep in mind that it does not depend on the toothbrush but certainly the brushing technique.